At The Herb Lady's Garden is a renovated and beautiful Pre-Civil War era farmhouse decorated with Victorian antiques and turn-of-the-century family heirlooms. 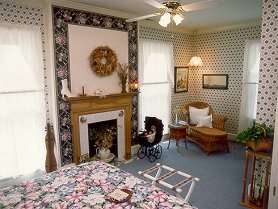 Each of the two guest rooms features a queen-sized bed, telephone, individual AC, original art and a private, modern bath. Extensive gardens and grounds and a formal herb garden add to a visit. 20 minutes to downtown shopping and Memorial Coliseum. 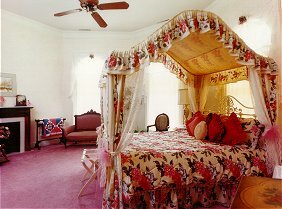 Room rates are based on double/single occupancy, breakfast choice (full or Continental), and length of stay. Senior rates. Cash and checks accepted. Reservation confirmed upon receipt of first night's payment. Deposit refunds with fewer than three-day notice made (minus $10 handling fee) if the room is booked by another guest. Check-in time 4-6 p.m.; checkout 10 a.m., or by mutual agreement. No guests under 18 years of age; no pets; smoking on grounds only. 'A Herbal Experience' can be added for an additional charge. 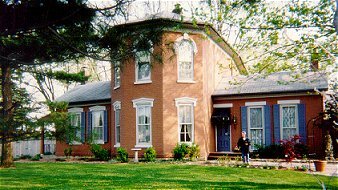 This and other Fort Wayne Bed and Breakfast Inns can be found here in The Register.